Southern Illinois University Edwardsville’s unique Undergraduate Research and Creative Activities (URCA) program is celebrating the extraordinary work of faculty mentors and students through four awards. 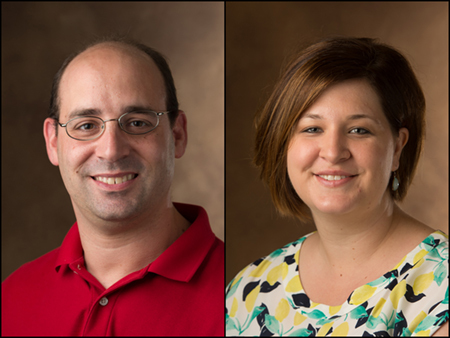 The Spring 2019 Vaughn Vandegrift URCA Research Mentor of the Semester has been presented to the School of Education, Health and Human Behavior’s James Panico, PhD, associate professor of speech language pathology and audiology, and Sarah Conoyer, PhD, assistant professor in the Department of Psychology. According to student mentor Alyssa Groene, Panico shows incredible passion for his work and is a strong motivator driving her to continuously achieve. Conoyer’s nominator, Nicole Ties, praised her ability to prepare students for their next steps in the real world through mentorship, research opportunities and teamwork experiences. 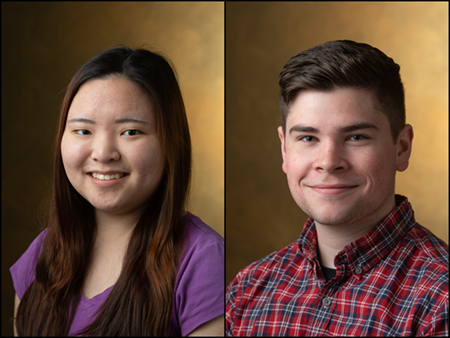 URCA students Jenna Heng, of Overland Park, Kan., and Tyler Cronister, of Springfield, were also recognized for their exceptional work in the program. Heng earned the Creative Activities Assistant of the Semester Award. Cronister received the Research Assistant of the Semester Award. “Jenna has taken to our work with enthusiasm and great attention to detail, and is both analytical and creative in her approach,” said faculty nominator Johanna Schmitz, PhD, professor of theater history in the College of Arts and Sciences, who referred to Heng as unflappable and indefatigable. “She has been as insightful as she is generous to bring our new researcher up to speed on our newly established protocols and standards,” Schmitz added. Faculty nominator John Matta, assistant professor of computer science in the School of Engineering, lauded Cronister for his leadership and persistence. When Matta’s original project took a surprising turn, Cronister never hesitated to investigate and reimagine the project’s possibilities. For more information about SIUE’s URCA program, visit siue.edu/urca. Photos: (L-R) SIUE URCA faculty awardees Dr. James Panico and Dr. Sarah Conoyer. (L-R) SIUE URCA Assistant award winners Jenna Heng and Tyler Cronister.